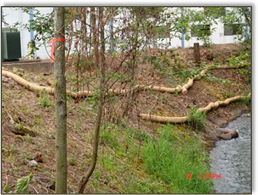 Prepared a bank enhancement design as a supplementary action to the primary goal of removing contaminated soils along a bank section of Johnson Creek on private industrial property. Prepared the City of Portland BES Environmental Review/Enhancement permit application and site plan. The enhancement resulted in slightly more flood storage and a significant improvement to the riparian vegetation by removing invasive species and densely planting native species. Designed a 12ft x 6ft x 30ft concrete box culvert to replace a 60-inch CMP culvert to improve fish passage at this road crossing. Project entailed stream and culvert topographical survey, HEC-RAS hydraulic analysis, design of downstream rock vane grade control structures and stream habitat enhancement. FDG prepared the requisite removal-fill permit documents and tailored the project to adhere to the NOAA SLOPES programmatic authorization. Additionally, the bid documents were compiled and FDG assisted the City with the bidding and construction phase of the project. 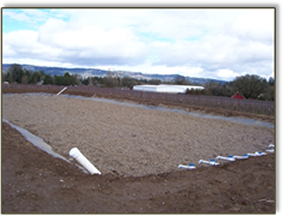 Oversaw the design of a constructed submerged flow wetland to treat process waste flows at the Duck Pond Winery. The project goal was to assist the facility to achieve National Pollution Discharge Elimination System permit compliance. Project involved analysing design flows thru various constructed wetland configurations to meet required effluent water quality parameters. Project entailed the placement of two 30ft x 12ft rock barbs with root wads integrated into the rock structures. 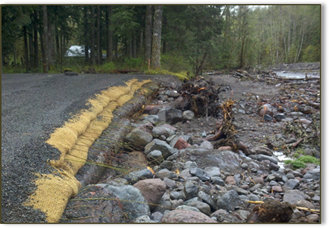 The bank had been severely eroded during a high flow event leaving a dangerous vertical bank on private property. The barbs were placed to direct the thalweg away from the bank and accumulate material overtime in the back eddy of the barbs. The banks were re-shaped and stabilized with a burrito roll style geo-matting and planted with native riparian species. The project involved securing ACOE/DSL permits and working within an essential habitat stream. 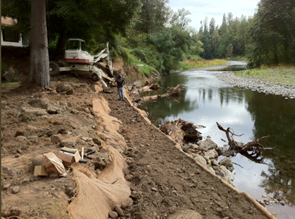 Preparing a bank stabilization design for approximately 200 linear feet of Sandy River bank that was recently severely eroded during the January 2011 high water event. This site is unique in that the river changed course and now flanks the opposite bank than pre-event. This allow the site improvements to be constructed outside of the water and the project is essentially a design to stabilize the bank at high water during future events.